Content Marketing is the key to generating inbound sales, allowing your business can continually engage new audiences. When you break down the numbers and see just how many marketers are on board with inbound marketing, the importance of content marketing for your business becomes very apparent. of marketers produce one or more piece of content per day. of consumers are influenced by custom content. of CMOs think custom content is the future of marketing. more leads are generated by content marketing at 38% the cost. A few more statistics that illustrate the power of content marketing. of marketers say creating blogs is their top inbound marketing priority. more traffic is generated by companies posting 16+ blog posts monthly. of B2B buyers desire content with more input from industry thought leaders. higher conversion rates for B2B companies who have adopted content marketing. How we take clients from Earth to the Moon. Once we have the proper data points for your audience, industry, and competition, it is time to begin the planning phase. This is where we come up with a comprehensive content calendar and overall approach for our content marketing strategy. We make sure that our strategy lines up with business goals by speaking directly with owners or managers in order to identify key metrics and targets with our content. The goal of this phase is to learn more about your industry, audience, and competition to uncover opportunities in the space that we can capitalize on with a high quality content strategy. 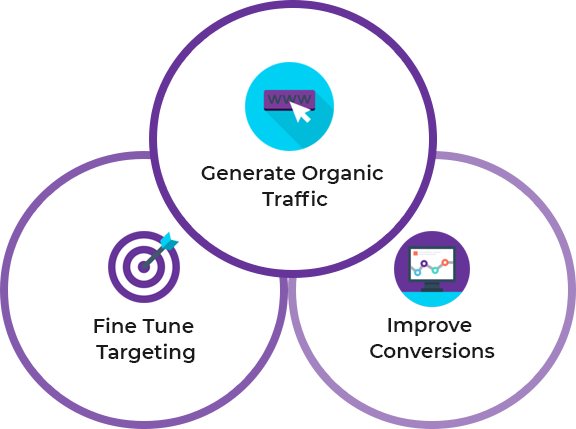 Once here, we monitor our campaigns to make sure we are constantly improving our rankings and driving traffic to your site.